I picked up this book to read because a blurb compared it to a book that we love in our house that we simply call “Guernsey”. (You know the one I’m talking about, the potato peel pie society one, that I surprisingly loved.). I say “surprisingly” because I’ve spent my career studying “heavy” classic literature. I have a Ph.D. in Spanish literature and I love the heavy, dense classics for many reasons. Once in a while, however, I’m drawn to lighter reads that can transport me to interesting locations populated with funny and realistic people. Just like Guernsey, reading this novel did that magical thing that good books do: it invited me in a subtle (not awkward) way to live and experience right along with the characters. The historical context of the German blitz of London (here it comes and it sounds so cliché) came alive for me. The humor is delicate and not overdone and the tense and dramatic moments indeed had my heart pounding stronger than it usually does. I also greatly appreciated the fact that the writer refrained from pouring explicit sexual and violent depictions into the narrative. It’s a very appropriate read for young teens. The writer’s use of the epistolary format (similar to Guernsey, but to a lesser extent here) was creative and sometimes surprising. My one nitpick would be the one-note characterization of Mrs. Bird. I would have liked to have seen a more dynamic character, one who has a deep epiphany of her ridiculousness at the end of the novel. The message of empowered women is compelling yet not overwrought. It truly is a delightful story and I hope it gets its deserved attention. If you loved Guernsey, give Dear Mrs. Bird a try! Set during WWII you follow Emmeline, who wants to work as a war correspondent. When she sees an advertisement for a job at a publishing company Emmeline feels this is just the job she needs. 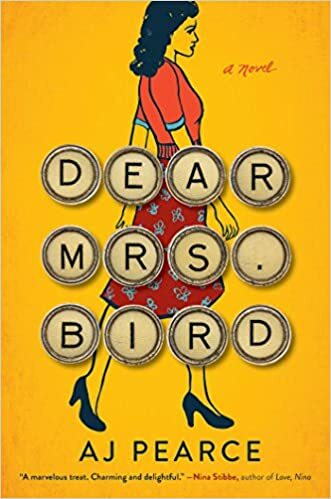 Emmeline soon finds out the job was not what she was expecting, but instead working for a magazine typing up the answers from Mrs. Bird in an advice column. When certain letters are ignored for unacceptable material Emmeline takes matters into her own hands. Emmeline was a determined character, she has strong ambitions to work towards a career as a war correspondent. She has a lot of empathy towards the readers that are seeking advice from Mrs. Bird. I liked that she wanted to reach out and help these readers that Mrs. Bird would refuse to help. While Emmeline had good intentions she shouldn’t have forged Mrs. Birds name. Emmeline also had a great friendship with Bunty, they each looked out for one another and were there through the rough times. Being set during WWII you are shown all the trials and tribulations that citizens endured during this difficult time. You are shown the horrors and how close tragedy hits to home. You also see great resilience in how the citizens tried to keep living their life. This was an enjoyable read that had funny moments as well as sad. I would recommend this book for any that enjoy historical fiction particularly ones set during the WWII era. I willingly received an advanced copy from NetGalley. All thoughts and opinions are my own. This is an enjoyable,sometimes hilarious and lighthearted story, but also contains sadness and heartbreak. It focuses on people courageously attempting to lead normal lives in London, 1940. Many volunteer to aid in the war effort during a time of German air raids with bombs dropping on the city. Still life goes on, and love, romance and friendships develop and endure. There is also tragedy, loss, misunderstandings and hardships and a theme of forgiveness. Emmeline is a volunteer part time telephone operator for a auxiliary fire department which is kept busy with fires caused by German bombing. She has dreamed of becoming a war correspondent, perhaps interviewing victims of the Blitz or even working behind enemy lines. She sees an opportunity to eventually fulfill her goal when she replies to an ad to work for what she believes is a leading London newspaper. Instead she finds that the position was for a failing womans’ weekly magazine as a typist. Her boss is the frightening Mrs. Bird who writes an advice column. Among Emma’s many chores is sorting and cutting up letters requesting Mrs. Bird’s advice which she would judge as Unacceptable and the writers depraved. Only the mildest pleas for advice can be passed on to Mrs. Bird. Even these are usually answered with blame and sarcasm. Letters never to reach Mrs. Bird’s desk are those dealing with relationships (premarital, marital and extramarital), the effects of war, politics and religious matters. While sorting the mail, Emma feels sympathy for some of the writers and wants to help and give them words of encouragement. She is young and has limited experience, but studies how the more popular and successful magazines deal with similar problems in their advice columns. She personally and secretly replies when there is a stamp and address, knowing Mrs. Bird would never help. This could cause her a lot of trouble, but even worse she inserts some of her advice into the magazine when the writer seeking advice was anonymous. To make matters worse she forges Mrs. Bird’s signature. There is suspense wondering if Emma’s act will be eventually discovered and if so, what the repercussions might be. In the midst of this romances develop for Emma and her best friend/roommate and tragedy disrupts their lives and those around them. I thought this was a lovely book. Thanks to NetGalley and Simon& Schuster for the advance copy in exchange for an honest review.